Sometimes it happens that you open a website and simply fall in love with the font that has been used on it. Now what are you going to do to get it — and quickly? One way to know the name and source of the font is to email the webmaster and asking it. But this process will take time and who knows, maybe the webmaster won’t even reply. So here is a list of free online tools that let you identify a font — quickly!. WhatTheFont is a great tool that is developed by one of the biggest font providers. All that you need to do to identify a font is to upload its picture and upload it to their servers, or add a link of the image on WhatTheFont interface. Now you will see a multiple font results. If you still can’t find the font you are looking for, then you can go to their Font Forum, post the image and wait for replies from font experts. This is a totally different tool from WhatTheFont and finds the font by a different method. It will ask you a few questions regarding the font. It is particularly helpful if you don’t have a picture of the font. The service claims to be ‘the largest independent directory of typefaces on the Internet, with information about fonts from 534 publishers and 143 vendors’. Well as the name suggests, it is a community of font experts. But the special thing is that it is the greatest and largest community out there! Here you post the picture of a font and get replies regarding the name of the font. 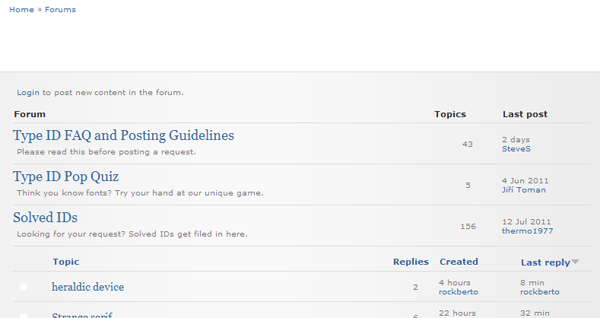 If you fail there check you can ask the same question/post a picture on other sites that have message boards. This site has heaps of information and it is also a multiple online font finder tools. The process is simple, you have to answer a few questions regarding the shape of the glyphs of the font you want to find. It is quite like Identifont, but to input all the data is quite quick and easy as it is all in one page whilst on the other hand Identifont has multiple pages and it gets a bit irksome. It includes guides for Script Fonts, Bauhaus-style Fonts, Sans Serif and Serif Fonts and Lined Fonts. Bowfin Printworks’ owner is also willing to answer any font ID questions free of cost through email. TypeNavigator is developed by Fontshop. It is quite similar to Bowfin Printworks as it works on the same principles i.e asking questions about the shape of each character. flickr has a group which identifies fonts and another group that shows fonts used in different pictures called Fonts in Use, that is useful for quick reference. Sometimes the easiest way to find a font is simply by checking out the lists of the most widely used fonts. Here are some lists that can be used for quick reference. Thank you for sharing the Message board as well. Till now, I’ve tried WhatTheFont only.